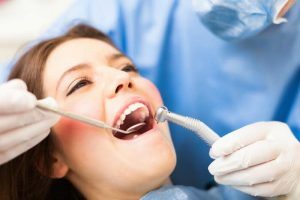 A dental cleaning can be an appointment that inspires fear or dread depending on how well you’ve taken care of your teeth in the intervening months. Going to the dentist doesn’t have to be scary, says Dr. Sid Solomon. His team offers some important tips patients should be aware of that will make the process easier for everyone. Get in the habit of flossing daily. Schedule time for yourself in the morning or evening, whichever is best for you, and make sure you take 5 minutes out of your brushing routine to floss. Flossing allows you to get to those hard to reach places in the mouth and really give your gum line a deeper cleaning than with a toothbrush. In addition, be sure you practice good brushing habits too. Spend time brushing along your gum line and make sure you invest in a good tooth brush for a reliable cleaning. Some patients even consider buying an electronic toothbrush or waterpik. Both can be useful, but be sure you consult with your dentist to see what his or her recommendation is for you. Cleanings are supposed to be uncomfortable, but too much pain may mean your hygienist just isn’t working with you. Ask your office if there is another hygienist available, or switch offices. If you’ve done everything in your power to keep your teeth clean, and you’re still experiencing discomfort, a change of pace could be useful and relaxing. Article submitted by Dr. Sid Solomon. Schedule your consultation today with Dr. Sid Solomon D.D.S. for a relaxed, non-invasive dental experience.